With a history of designing synthetic grass golf greens that dates back to our company’s founding, we take the golf market very seriously. In fact, it so important to us that we created an entire division run by golfers to develop the finest golf solutions in the industry. Working with them, we have developed an entire line of synthetic turf systems designed specifically for golf applications. So, whether you are looking to re-create the 12 th hole at Augusta in your backyard or just want to add some golf activities to your facility, XGrass has the turf for you. Anyone who has tried to install a backyard putting green quickly gains an appreciation for how hard it is to be professional greenskeeper. As if building a putting green was not hard enough, maintaining one can be a full-time job. These challenges extend to the tee boxes and any others areas where divots makes growing grass a constant battle. 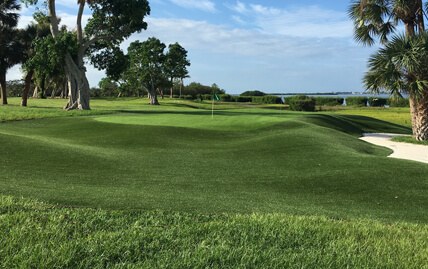 XGrass has engineered a number of low-maintenance synthetic grass systems designed for practicing and enjoying all aspects of the game of golf. XGrass offers a number of synthetic grass products for building all types of golf greens - from putting greens and short game greens to complete backyard golf courses. Our nationwide network specializes in installing tour quality golf greens that look and react just like a real bent grass putting green, without the daily maintenance. One of the key benefits of working with XGrass is that we are part of the Recreational Group family of companies. 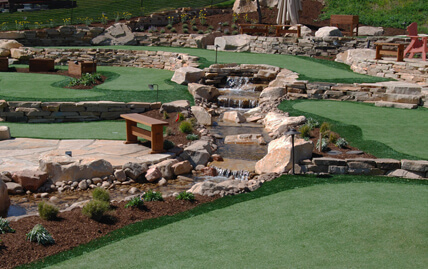 So, if your project includes a golf component, but is not limited to a golf green, we can work with you to transform your space with solutions like mini golf courses, shuffle board courts, and bocce ball courts. Driving range and other high-traffic tee areas can take a beating. 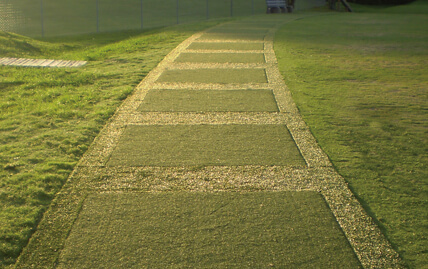 Tour Greens synthetic turf for golf tee lines gives you and your members a year-round edge for practice or play in all weather conditions. We’ll work with you to select the turf system necessary to stand up to the task and provide the solution you need. You can also visit Tour Greens to view our synthetic turf tee line solutions and complete line of portable putting greens and hitting mats.